Ever notice that as our skin ages , not only do we get fine lines, dryness and wrinkles, but our skin tends to look dull, lifeless and uneven. The skin may also start to look thinner and show dark shadows where there were none before. 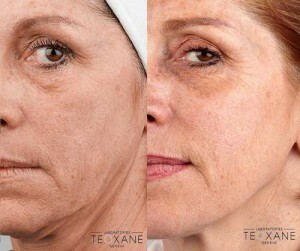 With Teosyal Redensity 1 treatments, you can kiss that old thin skin goodbye! Teosyal Redensity 1 feeds, hydrates and thickens the skin. This treatment combines three natural antioxidants, eight amino acids, vitamin B6, and hyaluronic acid (a natural hydrating agent) – all naturally occurring ingredients in the skin. In combination, they work to combat the signs of aging, while redensifying the dermal layer (or deeper layer of the skin) where collagen and elastin are produced. 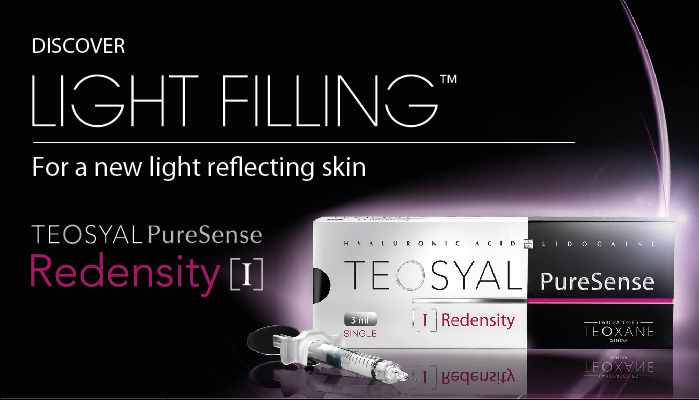 Teosyal Redensity 1 is NOT filler, but the technique is similar to a European procedure known as mesotherapy. Mesotheraphy is a non-invasive light filling technique, which is administered through a very fine needle placed superficially under the skin. It is uncross-linked hyaluronic acid as well. Even after one day, the results are overwhelming! There is an overall luminosity and softness to the appearance and texture of the skin as well as a lessening of fine lines and crepey skin. Treatments are done in a series of 3 treatments, three weeks apart. Our patients who have had this treatment, are excited and eagerly await their second and third session because they are so impressed from the changes in their skin from only their first treatment. Teosyal Redensity 1 can be used for the face, neck, décolletage and hands as well.